Next review Empire Today - Love them!! It’s our goal to provide award-winning customer service before, during and after your installation. We view all customer purchases not only as a one-time event, but as an ongoing partnership. We understand that we’re currently working with you towards a resolution and look forward to amicably resolving this matter. Just plunked more than $3000 down on new carpet. First time we vacuum the carpet, it snares and pulls up a large thread. Guy who installed it comes out, "fixes" it. Happens again, same response from Empire. Happens a 3rd time, I am promised a call within 24 hours....6 days later no call back. Rude call center employees to boot. NEVER will I use you again. And, I'm going to start telling anyone who will listen how awful my experience has been. Not sure anyone will read this, and if they do that they would care....but on that extremely remote chance, my phone number is 734-634-2943. Why do you have to enter at least 100 words before this platform accepts a person's review?? Seems like another way for your company to dodge feedback from customers. 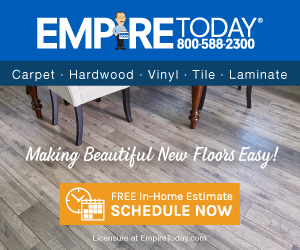 Product or Service Mentioned: Empire Today Carpet Flooring. Preferred solution: I want the defective carpet replaced.. I didn't like: Broken promise. Review #1070055 is a subjective opinion of User1070055.